Book our 5 days Cairo, Luxor & Abu Simbel tour. Imagine that now you have the chance to visit the remarkable Giza Pyramids Complex and the marvelous Sphinx plus the Valley Temple and the huge Egyptian Museum. That’s not all as you also have the chance to visit the magnificent Abu Simbel temple in Aswan. Your last destination in Egypt will be visiting Luxor tourist attractions, starting from the Valley of the Kings, Hatshepsut Temple, Colossi of Memnon, and Karnak Temple. Do not hesitate and book us now to enjoy this unique chance. Representative will meet and assist you at Cairo Airport to finish all of your paper transactions. 2 Nights accommodation at 5* hotel in Cairo. 1 Night accommodation at 5* hotel in Luxor. A private professional Egyptologist during the whole of your tours. Fees of Entrance to all the mentioned historical places in the Itinerary. A private air-conditioned car for you in all of your transfers. Enjoy being in the wonderland of the great Ancient Pharaohs. Upon your arrival, our professional delegate will meet you at Cairo Airport and offer you the best service for all of what you need to finish all of the official papers till reaching your 5* hotel in Cairo for overnight and enjoy your delicious dinner while looking through the window at the fanciful view. Start your Cairo, Luxor & Abu Simbel tour by having your tasty breakfast meal and then your tour Guide will take you on a tour to explore Cairo tourist attractions starting with the outstanding Giza Pyramids, the Sphinx, and the Egyptian Museum. It has many tombs. It consists of the great Giza Pyramids (Khufu, Khafre, Mankaure) that are considered to be one of the seven wonders of the world and Khufu Pyramid is considered to be the grandest in the complex… This complex also contains the amazing Sphinx and the Valley Temple. It’s an astonishing engineering accomplishment as it’s the greatest Pyramid that has ever been built. It was built by King Khufu. It contains about 2300000 blocks. These white Tura limestone blocks give the pyramid a smooth surface. It is the oldest known monumental sculpture all around the world, all tourists come from around the world to witness the beauty of its shape as it has a head of a man (Khafre’s head) and a body of a human which has many spiritual and mythical meanings. It is a gorgeous space as its inner space has witnessed the purification and the Mummification process of the mummy of the king. After having a dazzling experience in Giza, you’ll have your toothsome lunch meal and will move with your expert tour guide to the Egyptian Museum. You can not come to Egypt without visiting the marvelous Egyptian Museum that contains recherché Ancient archaeological items. It is the largest museum in the region. Finally, we transfer you to the Airport so that you travel to Aswan. Our representative will help you to have your reservation at 5* hotel with a beautiful view so that you have your overnight. 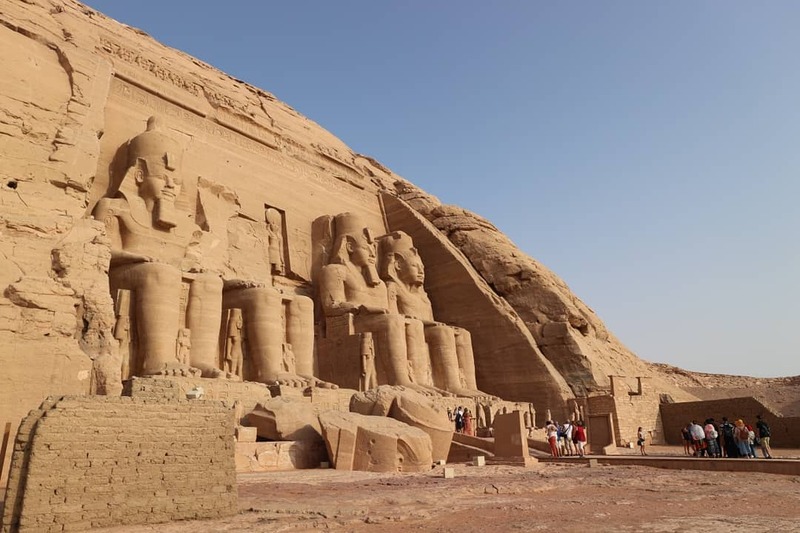 Morning time, eat your awesome breakfast and join your guide to continue your Cairo, Luxor & Abu Simbel tour by having a special tour to Abu Simbel. It is a site that consists of two temples built by the Egyptian King Ramses II. There are four colossal statues of Ramses in front of the main temple which are magnificent examples of Ancient Egyptian art. You will have now your special lunch and go with our representative in a private air-conditioned vehicle to the train station in Aswan to travel to Luxor. You’ll have an unforgettable night at a 5* hotel in Luxor where you are going to stay for overnight. It’s royal burials that are located in the west bank of Luxor that has 63 terrific royal tombs. It’s the final resting place of Egypt’s rulers from the 18th to the 20th dynasty, it is home to tombs including the great Pharaoh Ramses II and King Tutankhamen. The tombs were well stocked with all the material goods a ruler might need in the next world. Most of the decoration inside the tombs still well preserved. It is a mortuary temple at Deir el-Bahri. It was built by Queen Hatshepsut who is considered to be one of the most formidable women in ancient Egypt. They are two incredible massive stone statues for the royal Pharaoh, Amenhotep III. They depict him in a seated position and they are made from blocks of quartzite sandstone. Now it’s your time to have your lunch and go-ahead to continue the rest of your tour in Luxor. It’s so impressive temple and one of the top Egypt tourist attractions because it’s the largest temple ever. It’s, in fact, three temples suited on 247 acres of land. It is dedicated to Amun-Re, who is the main deity of the Theban Triad. Now you are going to fly back to Cairo for overnight. You will have your delicious breakfast and join our representative to check out and go safely to Cairo Airport to fly back home and end your Cairo, Luxor & Abu Simbel tour. If you didn’t find what you are looking for, then you can check our Egypt tours packages and choose your dream vacation, or contact us via Egypt travel planner.